Capstone Financial Group, Inc. provides unbiased, fee based financial planning, retirement planning and investment advice individually customized to meet each client’s needs. We are an independent firm which conducts business following principles of honesty, service, and competence. We aspire to be the most client centric and employee friendly company in the industry. We provide friendly, courteous and responsive service and always strive to make each client and participant feel as if they are the most important person with which we communicate. We believe every client has a unique situation, and clients’ needs vary. Our role is to provide our clients with greater financial independence and confidence in their investments by helping them make smart, well-informed decisions about their investments and retirement plans. 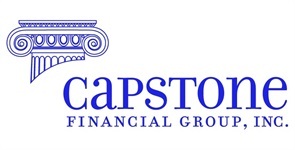 Capstone Financial Group pioneered the use of 401(k) plans by smaller employers and professionals. We remain committed to providing our clients with the superior service and support necessary to help small business owners and their employees become retirement ready.